BV Dairy have always had a very high focus on their environmental impact and everything is done to minimise impact on the local environment. 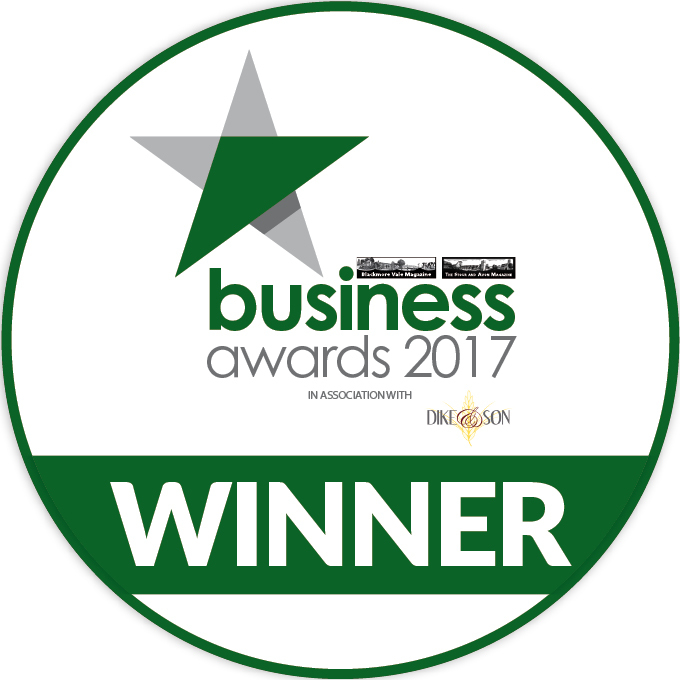 This dedication has been recognised at the Blackmore Vale Business Awards. 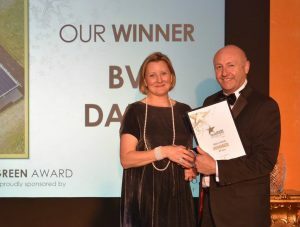 Harry Cowan, Commercial Director, proudly collecting the Blackmore Vale Business ‘Green’ Award. The Dairy has been certified to the internationally recognised Environmental Standard, ISO 14001 since 2011. All unavoidable waste and by-products from cheese production and plant cleaning are used to feed the onsite Anaerobic Digester which was commissioned in 2011. This converts the waste primarily to biogas and then electricity which is fed back factory. The onsite waste treatment also eliminates carbon miles by avoiding tankering it off site. Additionally, as part of our Federation House commitment pledge via Dairy UK, water saving initiatives are being worked on across the site, predominately with our Chiller systems and Pasteurisers. Constant consideration is given to recycling of all paper, card and plastics and, in the period from January 2017 this has increased by 6.0%. On the other side of the coin, the requirement for use of landfill over the same period has decreased by 56.3%. Staff across the entire site have been extremely supportive and recycling has now become part everyday life at the Dairy. Now, that is the longstanding ethos at BV Dairy but the additional reason for being considered for the Blackmore Vale Green Award in 2017 is for the work that was completed in 2016 when a brand new ‘state of the art’ chill store and distribution facility was opened. October 2016 saw the commissioning of the new chill store building; housing 1000 pallet spaces held at 3oC, and also incorporating new offices and storage which accommodates our customer services team, transport and storage teams along with production planning and engineering workshops. The design ethos of the chill store is based upon lean principles, efficient running, and full IT integration across all functions. 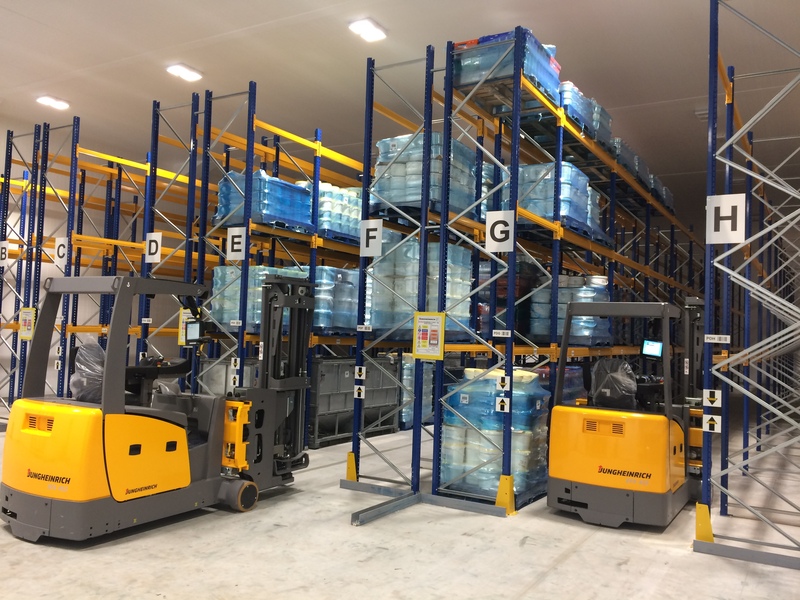 VNA (Very Narrow Aisle) fork lift trucks run on guidance systems which allows the maximise number of pallet spaces within the facility in the smallest area of space. IT systems control raw material delivery into the chill store, put away functions, stock replenishments and final order picking, loading and transport. A fantastic additional result, steaming from the construction of the chill store facility, is the Bio Diversity Project that is also now sited between the building and the AD Plant. This is a planting scheme and pond system that we allow to propagate naturally, providing a valuable area for wildlife of all kinds to live and flourish. Here is what our MD, Jim Highnam, said ahead of the presentation.